paid of the use of money. 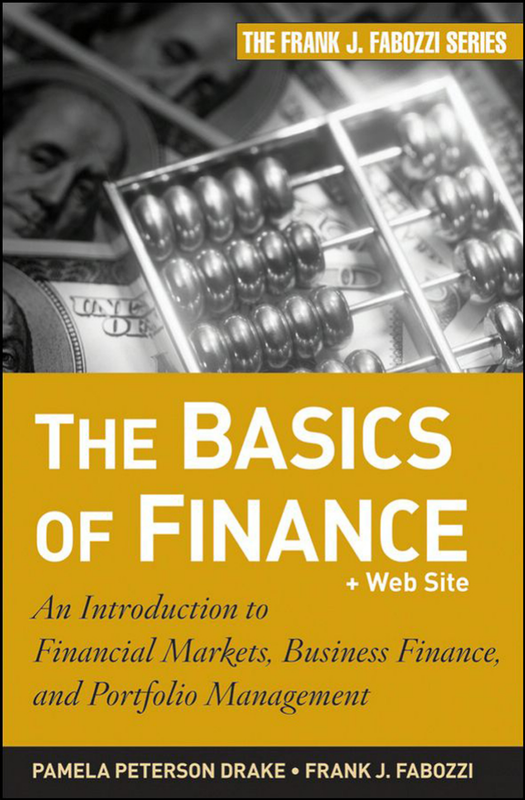 and financing arrangements and is the subject of this chapter. relative to any one point in time. 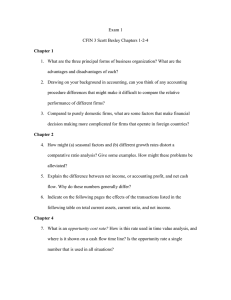 Reason 2: Cash flows are uncertain. techniques of compounding and discounting. the lender didn’t lend the $100, what could he or she have done with it? associated with getting the money back as promised. the amount that you are willing to lend today is the loan’s present value. exactly as set forth in the loan agreement. $1,000 is the value today, the present value, PV. $1,050 is the value at the end of one period, the future value, FV. 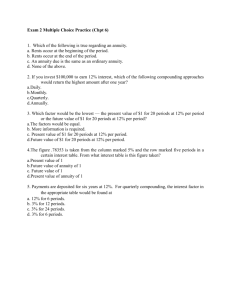 5% is the rate interest is earned in one period, the interest rate, i.
period and the principal remains the same. is $1,052.50. If this were simple interest, the future value would be $1,050. Therefore, the interest on interest—the results of compounding—is $2.50. The value of N is the number of compounding periods, where a compounding period is the unit of time after which interest is paid at the rate i. A period may be any length of time: a minute, a day, a month, or a year. present dollars and future dollars, n compounding periods into the future. Interest on interest totaling $128.89. the investment (negative cash flow). company guarantees a specified interest rate for a period of years. periodic payments, we used a zero for that argument. savings account balance increased 5% per year. ignores the process of compounding, so this is not the correct annual return. annual return or the true return—is 5% per year. five years. What is the annual growth rate on your investment? referred to as the annual percentage rate (APR)—is 4%. investment at the end of 10 years? i = 4%/4 = 1% and N = 10 × 4 = 40 quarters. effects of this extreme frequency of compounding. time will cause 1 to grow to 2.718281.
magnitude of the organism itself. value to allow for different interest rates or growth rates for different periods. where iN is the interest rate for period N.
two years from now will be 6.5%. b. What is the average annual return on your CD investment? 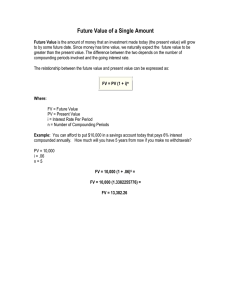 problems to solve present value problems. The future value, FV = $5,000. The number of compounding periods, N = 2. The interest rate, i = 5%. value of this investment at the end of the year? for discount periods ranging from 0 to 15 in Exhibit 10.3. We can also calculate this present using a calculator or a spreadsheet. willing to pay for this investment today? deposited in the account today to reach this goal? easier, we usually specify the growth rate as a rate per year. in 2006 the company paid $1.03 in dividends per share in 2006.
if there are no withdrawals and interest is paid annually? is $2,000, and CF2 is $1,500. 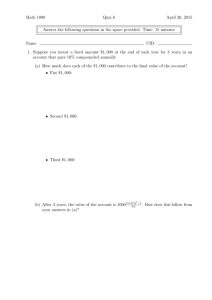 is (1 + i)0 = 1.
cash flows before the end of the series. discount the second period’s cash flow two periods. period would not have any compounding. of the fifth period is discounted five periods at the discount rate of i.
can earn 5% but an amount invested today for two periods can earn 6%. must be held is called the yield curve. each of the next four years in an account earning 8% compounded interest. How much will you have available at the end of the fourth year? $2,000 deposit, compounding interest at 5%, as we show in Exhibit 10.7.
compounding or discounting, is simpler than valuing uneven cash flows. Exhibit 10.7. The present value of this series is $7,091.90. account at the end of the five years? two examples that we provide in Exhibit 10.8 are both ordinary annuities. each of the next five years. end of the first period. number of payments extends forever—into infinity? to receive, in return, the promise of $100 each period forever. for $5,000 that promises to pay $50 at the end of every period forever. winnings are therefore an annuity due. 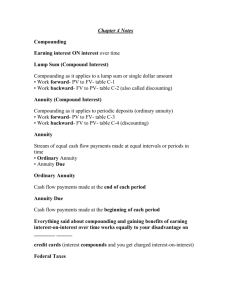 interest for one more periods in the case of the annuity due. of the ordinary annuity for an equivalent amount and number of cash flows. 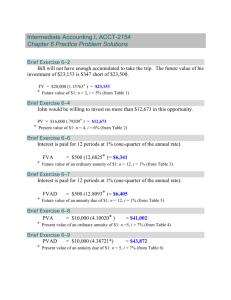 present value of the annuity due. ordinary annuity and then discount this present value to an earlier period. Step 1: Solve for the present value of the withdrawals. Step 2: Discount this present value to the present. show this in Panel C of Exhibit 10.9.
end of the third year is $185.95. possible on how these are designed. 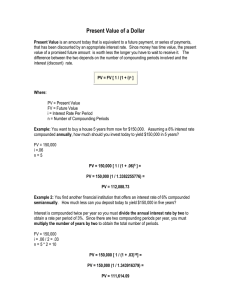 interest rate, and the number of payments. and then solve for PMT. This is the CF, the loan payment. amortization schedule, as we show in Panel A of Exhibit 10.10.
is paid with each payment. known as balloon payments. See Exhibit 10.11.
may require interest compounding monthly. the effective annual interest rate. of APRs, we need to understand how to work with them. semiannually and Bank B other offers 4.158% compounded continuously. 4.2441%. The effective annual rate for Bank B is e0.04158 – 1 = 4.2457%. Therefore, Bank B offers a slightly higher interest rate. Unfortunately, there is no direct mathematical solution (that is, closedform solution) for the IRR, but rather we must use an iterative procedure. $7,000 in two years, the return on your investment is 6.023%. a bond. Most bonds pay interest semiannually—that is, every six months. of the cash flows to be such that the discount period is six months. 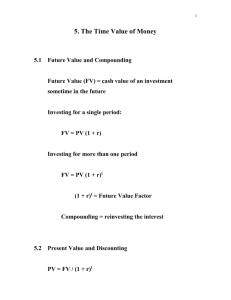 It is important to consider the type of interest—compounding vs.
value of a future value. to meet a goal, or to simply amortize a loan. discount rate to discount a future value to the present? 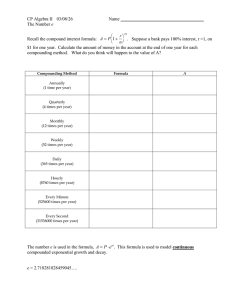 compounding, Account C: continuous compounding. 5. What distinguishes an ordinary annuity from an annuity due? 6. What distinguishes an ordinary annuity from a deferred annuity? 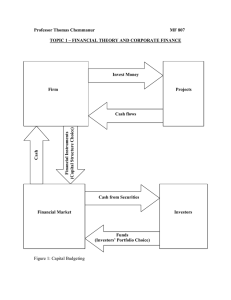 value the present value of this series of cash flows? geometric average growth rate? Why? 9. How can we break down the valuation of a deferred annuity into manageable parts for computation purposes? payments are identical, an ordinary annuity or an annuity due? (EAR) differ from the APR of 8%? what happens to the relationship between the EAR and the APR? b. After 10 years, how much interest on interest did you earn? of 3%, with payments made monthly.